How can you make your New Year’s Day even more auspicious? Let me say that, as much as I’m devoted to food, New Year’s Day always beckons me to go inside in contemplation, to be with my heart in stillness. At the beginning of the new year, my quietude takes on an eager anticipation. What do I want to create on the blank pages of my life during the year ahead? How can I be of most service? What spiritual practices and life activities will continue to expand my heart, helping me to embrace my soul’s purpose? My husband, Tom, and I will start the year off by chanting and meditating with a group of fellow seekers, followed by a festive and abundant lunch—a joyful way to launch another year as we recall the many blessings in our lives. Let me take this moment to wish each of you a very happy, fulfilling and healthy year ahead! My wish for the Sacred & Delicious community is for each of you to take some sacred time for yourselves as you begin the new year—and every day thereafter—whether it’s ten minutes or a few hours. Spend some time on your yoga mat or meditation cushion, in a church, temple, or mosque, or perhaps during a long hike in nature—whatever supports your ability to connect to the presence of the Divine in your life. 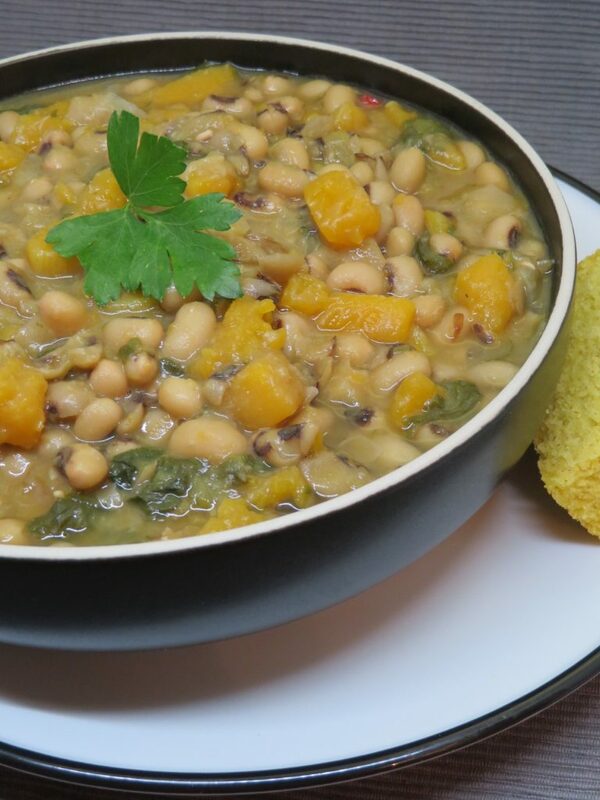 And if you happen to be hosting or participating in a potluck with your extended family or community of friends on New Year’s Day, I invite you to take along this recipe for good fortune: Smoky Black-Eyed Pea Soup with Collards! 1. Soak the black-eyed peas in cold water for two hours or longer. Strain and rinse the peas and place them in a pot with the stock, water, and bay leaf. (If you don’t have fresh stock, just use water and add ½ teaspoon of ground turmeric when you add the other ground spices in a later step.) Bring the pot to a boil; then reduce the heat to medium. 2. Clean the collard leaves (or other greens) and chop them into bite-sized pieces. You can chop the extended stems like celery. Add collards to the pot now. If using kale, you can add it after the beans have cooked 30 minutes, or add Swiss chard in the final 10 minutes of cooking time. 3. Chop the onion and sauté it in olive oil on medium heat for 10 minutes, or until the onions turn uniformly golden. Reduce the heat and continue to cook the onions slowly until they turn lightly brown and caramelized, about another 15 to 20 minutes. At that time add the ground cumin and coriander to the pan for about a minute, stir, and turn off the gas or set the pan aside.